The Elkhorn Mountains south of Helena, Montana are the remnants of volcanoes that were active in this area 74 to 81 million years ago. During that period, a tectonic plate was subducting beneath western North America, allowing magma to rise to the surface. As a result, the Elkhorns are made up primarily of extrusive igneous rocks, but are related to plutonic rocks of the nearby Boulder Batholith. The volcanic rocks that make up the Elkhorns (lots of andesite) formed when lava poured onto the surface and cooled, whereas the plutonic rocks (granite, etc.) of the batholith formed as magma beneath the volcanoes cooled underground. Despite the volcanic origin of the Elkhorns, the outcropping shown in the photo is made of marble - a metamorphic rock formed as limestone was changed by heat and/or pressure. 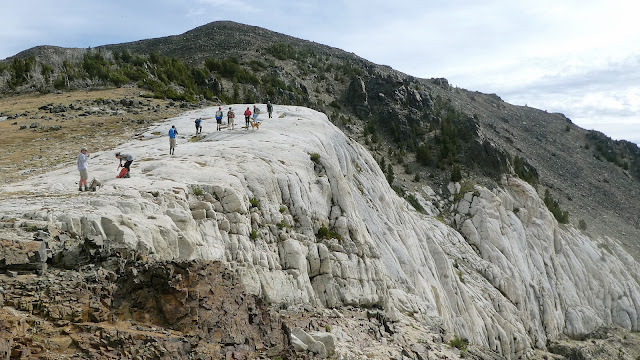 Sometime during the late Cretaceous, magma melted its way into the area, coming close enough its heat to change the limestone into marble - a process known as “contact metamorphism”. Evidence for this is the presence of granite (formed as that magma cooled), located not far below the marble. Limestone is usually formed by sediment deposited in a shallow tropical sea, so how did limestone form in a center of volcanic activity? One possibility is that hot springs existed here when the area was volcanically active. An unusual variety of limestone called "travertine" can form on the surface around hot springs by the rapid precipitation of calcium carbonate. This is what is happening today at Mammoth Hot Springs in Yellowstone Park where thick terraces of travertine continue to form as hot water comes to the surface. To access a blog a photo tour of the hike to the summits of Elkhorn Peak and Crow Peak, go to www.BigSkyWalker.com.